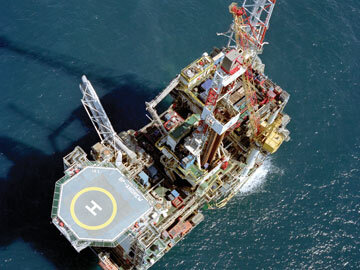 Injecting seawater into offshore oilfields is standard operating procedure for increasing production, such as at BP’s Andrew platform in the North Sea. Similar procedures may someday become standard for carbon sequestration as well. Worries about atmospheric carbon dioxide levels have sparked ideas for a range of carbon sequestration scenarios. One concept is to bury the greenhouse gas in underground geologic formations, but so far it hasn’t been clear whether carbon dioxide would actually stay there or whether it would quickly escape back into the atmosphere. A new study suggests that it just might stay put, supporting the notion that storing the gas deep beneath Earth’s surface could be a viable long-term carbon storage solution. But so far, studies that had looked at such mineral reactions in the lab suggested that they take thousands of years to happen. “On that time scale, mineral reactions are not going to have much impact on the risk of leakage in reservoirs,” says Ian Duncan of the Bureau of Economic Geology at the University of Texas at Austin. To better understand how these mineral reactions might occur in the real world, Yardley and his colleagues examined a large dataset that listed the contents of water produced at the BP-operated Miller oilfield in the North Sea, where during ongoing enhanced oil recovery efforts, BP had been injecting seawater into the formation to enhance oil production. When analyzing the data, the researchers found unexpectedly large amounts of silicates, minerals that are a major component of sedimentary rock formations, in the water that was then pumped out of the field. That indicates that the injected water reacted with the sedimentary rocks in the oilfield, which has implications for carbon dioxide storage, Yardley and his team reported in Geology in December. Yardley and his team say that their results indicate that the injected seawater had already started to dissolve silicates in about a year. “We usually think of silicates as being very slow to react. Mountains are made of them, so you don’t expect them to just start dissolving,” Yardley says. But solubility goes up with temperature and pressure, which could have sped up these reactions in the hot underground formation, he says. He adds that it is tough to simulate the scale of the process in the lab, and “it’s very difficult to relate the reaction rates that you get in the laboratory to what might happen in the field.” However, “here we have a field experiment, which was done in exactly the sort of setting that people are talking about for disposing carbon dioxide underground,” he says. Duncan cautions that further studies are needed to pin down the mechanism by which the water injected into the Miller oilfield dissolved rock minerals. “These silicates are coming from the rock, but the question is whether or not they are coming from some transitory phenomena that may soon disappear.” For example, it could be that very small amounts of finely grained, highly reactive materials are present in the formation. “If the seawater was reacting with that then this might explain the results, but it wouldn’t have any large-scale effect on carbon dioxide sequestration because once those things are gone then that would be the end of it,” he says. Nevertheless, “the authors have some very interesting results that, if substantiated by further studies, have very important implications for carbon dioxide sequestration in terms of lowering our estimate of the risk of leakage,” Duncan says.